It was to be one of the strangest chapters in the storied history of the Beatles. In most Beatle controversies, John Lennon, the most outspoken and controversial Beatle, was usually at the bottom of it, but not this time. George Harrison “The Quiet Beatle” brought on the 1963-64 Jelly Bean controversy that was to drive the Beatles batty. In a 1963 television interview, George told the TV host that Jelly Babies were his favorite treat and that John had “stolen his Jelly Babies”. OK, no big deal, right? The Beatles were soon inundated by boxes of Jelly Babies sent to them by their fervent fans, but that was to be expected. But within a few short days, when the boys started taking the stage for their concerts, their adoring worshipers started throwing Jelly Babies onstage, almost as a sacrificial offering, to please their idols. The sweet treats were thrown both “to” and “at” the boys. The Beatles hated it right off the bat. One can easily perceive George’s un-muted anger at the proffered sweets. But that was in England, the worst was yet to come. For those of you uninitiated, Jelly Babies are soft little sweets, the British counterpart to the American Jelly Beans, but much softer. The Beatles came to America in February of 1964 and probably felt relief that now that they were in the good old U.S.A., the Jelly Baby tossing was over and done with. But it was about to get worse. Ringo, being the band’s drummer, had it a bit easier than the others and was slightly safer, as he could crouch and hide behind his drum kit. Poor George, John, and Paul had to stand right in the face of the fire, with no protection other than their guitars. The Jelly Bean projectiles were to continue throughout the Beatles’ first American tour. 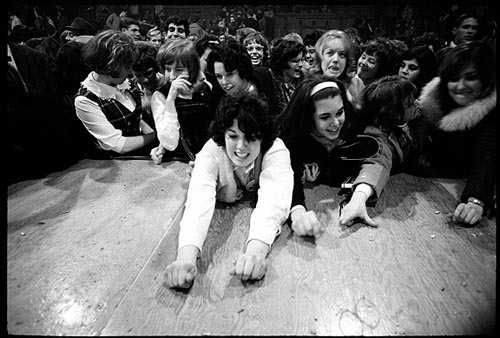 In fact, in August of ’64 at the Cow Palace in San Francisco, the concert had to be stopped twice because of the hail of Jelly Beans. They were pelted with what would be the American equivalent of gummi bears.